Researchers identify the causal link between telomere shortening and idiopathic pulmonary fibrosis. Idiopathic pulmonary fibrosis (IPF) causes a gradual loss of respiratory capacity and can be lethal within a few years. The cause is unknown, although it can be attributed to a combination of genetics and the environment. Now, a team of researchers from the Spanish National Cancer Research Centre (CNIO) and University of Madrid have discovered that telomeres, the structures that protect the chromosomes, are at the origin of pulmonary fibrosis. The team state that this is the first time that telomere damage has been identified as a cause of the disease. They go on to add that this finding opens up new avenues for the development of therapies to treat a disease for which there is currently no treatment. The study is published in the journal Cell Reports. Previous studies show that idiopathic pulmonary fibrosis is a respiratory disease affecting about 8,000 people in Spain in which scars are formed in lung tissue that make it rigid, leading to breathing difficulties. In the absence of a single and determinant cause, researchers compile clues that piece together different parts of the problem. One is that the exposure to environmental hazards, such as radiation, smoking or pollution, greatly increases the risk. The team note that earlier studies already pointed to the telomeres with results showing that the telomeres of many patients suffering from idiopathic pulmonary fibrosis are shorter than normal. They go on to add that pulmonary fibrosis is one of the most frequent illnesses among people with mutations in genes involved in telomere maintenance. These previous studies suggest that there is an association between telomere defects and the disease, however a causal link was pending. In search of this cause-effect relationship the researchers created a mouse that lacked a protein needed to build telomeres in a specific cell population, type II alveolar cells, and which is indispensable for lung tissue regeneration. The results showed that most of the animals developed progressive pulmonary fibrosis. Thus the researchers, after finding that the lack of telomeres is lethal for type II alveolar cells, reached the conclusion that lung epithelium cannot regenerate without these cells and, therefore, cannot repair damage caused by toxic environmental agents. 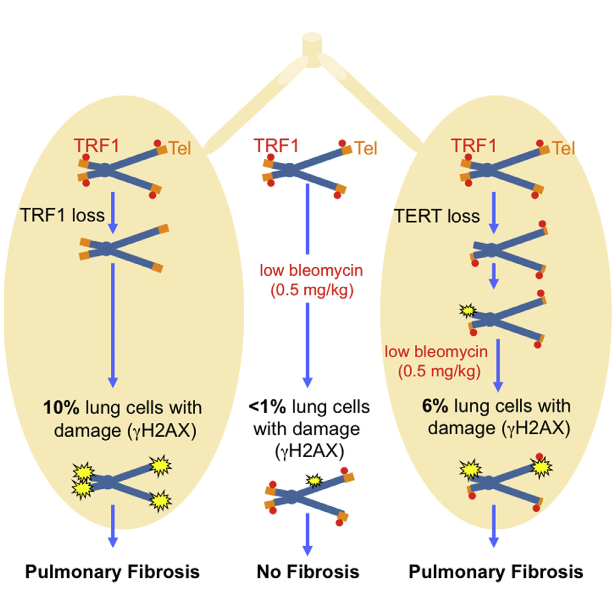 The team state that this result demonstrates, for the first time, that telomere damage may cause pulmonary fibrosis with the results conclusively showing that acute telomere damage is sufficient to trigger pulmonary fibrosis, even in the absence of environmental damage. The researchers stress that although the mouse lacking telomeres in pulmonary epithelial cells proves the importance of telomeres in the origin of fibrosis, it does not reproduce the disease in most human patients. In humans, earlier studies show that environmental hazards play an important role in the disease. Furthermore, short telomeres are also a feature of the disease. Very short telomeres are a permanent damage to cells and they stop dividing. When this happens, pulmonary tissue ceases to regenerate with studies observing a protective programme against damage triggered that causes scar formation and leads to fibrosis. To simulate this the current study used an animal model that combines premature shortening of the telomeres due to telomerase deficiency, with low doses of environmental damage. To induce damage the team chose bleomycin, a drug that affects the genetic material of cells and inhibits cell division when administered in high doses, however, not enough to cause pulmonary fibrosis in normal mice at the low doses administered in the current study. The data findings showd that there is a synergy between the damage caused by bleomycin at low doses and the one caused by short telomeres. The shortening of the telomeres is not in itself sufficient to generate fibrosis, nor, in general, is bleomycin at low doses; however, the results show that both factors together do trigger the disorder. The team explain that these findings support a model in which persistent damage derived from short or dysfunctional telomeres is added to other cellular damage and this triggers pulmonary fibrosis. They go on to add that the new animal models are essential for testing new therapeutic strategies based on the activation of telomerase. The researchers surmise that this new evidence, which focuses on telomeres, fits in well with the fact that idiopathic pulmonary fibrosis only occurs in people over 50 years of age; it is precisely in the telomeres where one of the main molecular symptoms of cellular aging occurs. The team conclude that understanding the molecular mechanisms that lead to the aging process, such as the shortening of telomeres, enabled them to generate animal models that faithfully reproduce diseases such as idiopathic pulmonary fibrosis, and is already helping the lab to test novel therapies that they hope will prove effective and that are based on the activation of the enzyme telomerase. Idiopathic pulmonary fibrosis (IPF) is a degenerative disease of the lungs with an average survival post-diagnosis of 2–3 years. New therapeutic targets and treatments are necessary. Mutations in components of the telomere-maintenance enzyme telomerase or in proteins important for telomere protection are found in both familial and sporadic IPF cases. However, the lack of mouse models that faithfully recapitulate the human disease has hampered new advances. Here, we generate two independent mouse models that develop IPF owing to either critically short telomeres (telomerase-deficient mice) or severe telomere dysfunction in the absence of telomere shortening (mice with Trf1 deletion in type II alveolar cells). We show that both mouse models develop pulmonary fibrosis through induction of telomere damage, thus providing proof of principle of the causal role of DNA damage stemming from dysfunctional telomeres in IPF development and identifying telomeres as promising targets for new treatments. Mice with Pulmonary Fibrosis Driven by Telomere Dysfunction. Blasco et al 2015.